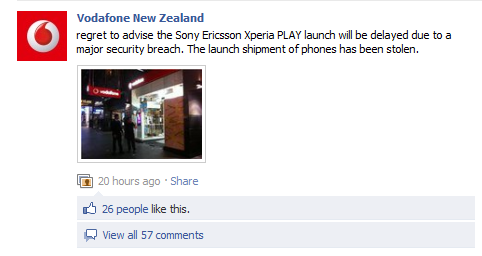 Earlier this morning, news broke of a horrible deed - the entire stock of Xperia Play phones was allegedly stolen from Vodafone NZ, leaving hundreds of giant-thumbed customers button-mashing nothing but air for the foreseeable future. We deliberately skipped this story, even though it was spreading like fire, but what happened next prompted me to grab my pen keyboard and give this crime some coverage. Remember those missing devices? Yeah, never happened. The whole event that started with last night's post on Vodafone's own Facebook page, later augmented with video footage of the alleged attack, was a carefully orchestrated stunt by the company. People around the web grew suspicious and started examining the recording, which, as it turned out, had an unusually high frame rate and horizontal lines that were made to look as if the video were recorded via a low-resolution security camera. Additionally, no timestamps could be found, all pointing to a fake. Why did Vodafone think this was a good idea? The following comment, posted about 40 minutes ago, should clarify a few things - an Epic Quest is about to be launched, with 6 prizes. Have you guessed what they are yet? 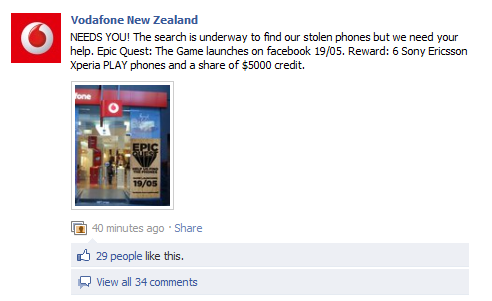 That's right - 6 Xperia Play phones, which you are supposed to help Vodafone find. Lame, Vodafone, quite lame. We know @DroidLanding did the scavenger hunt and was quite successful at it, with Google following suit (@GoogleNexus), but neither of them lied about the planted phones, pretending to be victims of a horrible crime. Perhaps your strategy is working, but it's left quite a bad taste in our mouths. Don't let us catch you red-handed in a similar mess again, OK?